(Nanowerk News) PIE Scientific LLC, a leader in low pressure high efficiency plasma source manufacturing, has recently released a revolutionary downstream plasma cleaner---SEMI-KLEEN plasma cleaner. It is designed to meet the toughest contamination requirements from the semiconductor capital equipment industry. The revolutionary low plasma potential discharge technique greatly reduces the risk of ion sputtering damage. Together with a proprietary two-stage filter gas delivery system, SEMI-KLEEN plasma cleaner has been proven capable of meeting particle contamination requirement for sub 10nm nodes. SEMI-KLEEN Remote plasma cleaner and the controller. SEMI-KLEEN plasma cleaner can be used for hydrocarbon contamination cleaning application in various electron and ion microscopes such as Scanning Electron Microscope (SEM), Focused Ion Beam system (FIB), Transmission Electron Microscope (TEM), Electron Beam Inspection system (EBI), Electron Beam Review (EBR) and Critical Dimension Scanning Electron Microscope (CD-SEM). Customers have reported better image resolution, improved image contrast and more accurate material analysis results after the chamber, stage and samples are cleaned by the SEMI-KLEEN remote plasma cleaner. With low particulate design, SEMI-KLEEN plasma cleaner has also been used on Atomic Layer Deposition (ALD) system and Extreme Ultraviolet Lithography (EUVL) research projects. SEMI-KLEEN plasma cleaner comes with smartCleanTM technology. Intelligent operation is enabled by an embedded microcomputer with touch screen user interface and multiple status sensors. Advanced plasma sensor monitors the strength of the plasma and displays this information in real time on the LCD screen and the control software installed on the microscope computer. It helps user set up optimal recipe for vacuum systems with different pumping speeds. 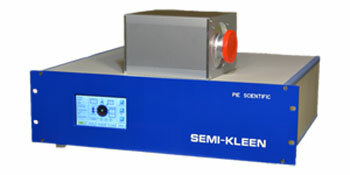 SEMI-KLEEN plasma cleaner can monitor the sample chamber pressure events with an embedded high precision pressure sensor. Such events can be used as interlock or trigger for intelligent operation modes. Pressure sensor can also be used to provide close loop feedback control for electronic gas delivery system. SEMI-KLEEN plasma cleaner also has 100 watt RF power supply with automatic impedance matching, electronically adjustable flow control, low EMI emission design and a quiet standby mode. PIE Scientific specializes in developing plasma technology for ion and electron beam applications. It is founded by alumni of the plasma and ion source technology group in the Lawrence Berkeley National Laboratory. After a decade of experience in developing high-resolution high-throughput electron beam inspection (EBI) and review (EBR) equipment for semiconductor industry, the founders realized that previous generations of plasma cleaners for contamination removal in electron microscopes don't meet the challenging requirements from the semiconductor industry. Therefore, they decided to use their expertise in plasma sources and electron beam microscopes and developed a state-of-the-art plasma cleaning solution for electron microscope industry. The smartClean™ technology has been well-received by the electron beam inspection and electron beam review equipment vendors.